Memento Analysis research papers discusses how to write a research paper on this suspenseful and complex crime story. What does the film’s setting say about the film? Does it play an important part in Memento? What is the strongest element of plot? Could it be the protagonist’s struggle with his memory? Is it the continually guessing of each character’s intentions? Where does the sense of isolation come from in the film? Is it from the setting or is it from the strange characters and their distance from the audience? Exploring Memento is easy, as it is a film that one feels drawn into emotionally. There are parts of the movie that are engaging, such as when Teddy tells Leonard that he’s been trying to help solve his wife’s murder. The audience, and Leonard, are put on alert since this doesn’t seem quite right. When doing a research paper for a film class, remember to look at from the perspective of cinematic themes and film elements. The use of color, lighting, setting and the like are all elements that can be further explored outside of the basic plot. A good film analysis research paper will explore, not reiterate. This is essential if success is what you are looking for! 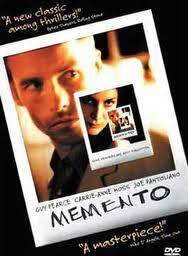 In the popular film “Memento,” the main character suffers from anterograde amnesia as the result of a head injury. The story line unfolds in reverse, with each vignette detailing what happened just prior to the events seen in the previous vignette; passages shift between black and white scenes of Leonard explaining how he functions with his condition and full color scenes of Leonard’s interactions with others. The main theme of the movie is that Leonard is unable to form new memories. Although he remembers the details of his past and some information about the incident that caused his injury, he cannot hold on to new information for any significant period of time. For this reason, he takes photographs of people and writes their names and important information on them, and carries these with him everywhere he goes. Additionally, Leonard has taken to tattooing a series of “Facts” onto his body; these facts are all snippets of descriptive information about the man who raped and murdered his wife, a man whom Leonard wants to find and kill. Also haunting Leonard is his past experiences with Sammy Jenkis, who also suffered anterograde amnesia; in his previous occupation as an insurance claims investigator, Leonard had denied Sammy’s wife’s claim and called Sammy’s condition psychological. Leonard is often depicted as engaging in a “system” he has devised to deal with his condition. He tells himself that the difference between him and Sammy Jenkis is that Sammy wasn’t organized, didn’t have a system. That is why things ended badly for Sammy. Leonard, on the other hand, has devised a system of writing down important information. He knows he can’t function well enough to talk on the telephone, so he avoids conversations that aren’t face to face. When he has a meeting with someone, he writes down the exact information. If a piece of information is evaluated and considered to be extremely important to his task—that of avenging his wife’s murder—he has a permanent note made in the form of a tattoo. He uses photographs to identify his car and the hotel in which he lives. In conducting research into anterograde amnesia, the type suffered by Leonard in “Memento,” literature revealed that the filmic representation of the disorder was actually true to the according symptomatology. A psychologist on Harvard’s Medical School faculty called the film “incredibly realistic,” although he also asserted that a head injury isn’t the usual culprit, as was Leonard’s case. Instead, short-term memory loss of the type suffered by Leonard is more likely caused by Alzheimer’s disease or complications related to chronic alcoholism. Whereas anterograde amnesia refers to an impairment in short-term memory and the inability for form new memories, retrograde amnesia is the more common type of memory impairment in which the sufferer cannot recall information from the past . As such, anterograde memory allows one to remember new events and information, whereas retrograde memory allows one to remember events and information from the past. It’s very difficult to find any evidence of how the film fails to provide an authentic representation of anterograde amnesia. Although Leonard’s initial injury may not have been an ample cause for the development of anterograde amnesia, the symptoms depicted by the film seem to agree with the clinical description of the impairment. Leonard indeed fails to remember people he sees everyday, and has to consult his photographs to determine where he lives and what car he drives, and to ascertain the position of a person in his life. We do not ever see a situation in which Leonard has formed a short-term memory; even in the scene in which he physically assaults Natalie, then seeks a pen to write down the details, Leonard doesn’t remember the event long enough to do so and asks Natalie what happened when she returns only moments later. Because anterograde amnesia is so rare, it’s hard to say whether “Memento” reveals any inconsistencies. However, the cinematic conventions employed by the movie’s director seem to convey the sense of confusion and disarray that Leonard himself might encounter. This serves to exaggerate the already complicated situation of Leonard’s past and present, and to allow the viewer to attempt a construction of events as skewed and disorganized as the thoughts in Leonard’s head. At the end of “Memento,” a new conflict is introduced, in that Teddy tells Leonard that he doesn’t know who he is- he knows who he was, but not who he has become. This conjures the issue of identity and the formation of identity, and allows the viewer to draw important conclusions about memory loss: if one no longer has the ability to form new memories, it is possible that one may also be unable to establish an identity in the present moment. As Perlmutter asserts, it could be that Leonard’s anterograde amnesia is a self-devised method for erasing the pain of guilt. Perhaps Leonard is really a crooked insurance scam artist, who took the story of Sammy Jenkis and appropriated it to create a whole opportunistic scenario for himself. We know that he came into some money due to his wife’s death, and that Sammy Jenkis’ wife killed herself due to her husband’s condition. It would seem that, regardless of whether or not the film consistently depicts anterograde amnesia, there is too much to the story for Leonard’s physical injury to be the sole explanation for his experiences. Indeed, “Memento” leaves the viewer questioning whether Leonard is the hero or the villain and whether he has been putting on an elaborate charade. Alzheimer's Disease Research Papers delve into the effects this disease has on the brain. 12 Years A Slave - 12 Years a Slave Film research papers overview the adaptation of Solomon Northrup’s slave narrative, recounting his 1841 kidnapping and sale into slavery. Chocolat Analysis - Chocolat research papers explore a sample of an order placed on the contrast and comparison of Chocolat the movie and the book. In North by Northwest research papers, many elements of the film can be explained. Personality Disorder Found Fatal Attraction - Personality Disorder Found in Fatal Attraction Research Papers look at a movie about a married man who has an affair with a woman that has this disorder, and the events that follow when he tries to end it. A Thousand Acres - The film, A Thousand Acres, explores human motivation. Saving Private Ryan - Saving Private Ryan’s historical accuracy will be the center of the project. Kramer vs Kramer Research Papers discuss how to write a film review and what points need to be explained in the review. Societys Perception of Nurses - Society's Perception of Nurses Research Papers delves into the gender- based rules of society about female and male nurses. Life is Beautiful - Life is Beautiful research papers delve into the potential reactions people choose when faced with a crisis such as Holocaust. Alvy Singer - Alvy Singer is a character from the film, Annie Hall, and is played by Woody Allen. The Godfather - The Godfather Research Papers look at the 1972 film which is focused on a sociological study of violence, power, and corruption. Platoon - Platoon is a bildungsroman, a coming of age story in which the hero is a young person “who sets out in life with either no aim in mind or the wrong one” and who “finally reaches maturity”. Cult Comparison Film - Research papers on Cult Comparison in Film discuss the glamorized perspective of American life, including both the good and the bad. The Wall: A Complete Analysis - Pink Floyd The Wall: Complete Analysis research papers look at the book written by Bret Urick and what the influence of parents and childhood events can have on a child’s developing psyche. Paper Masters writes custom research papers on Memento Analysis and discusses how to write a research paper on this suspenseful and complex crime story.